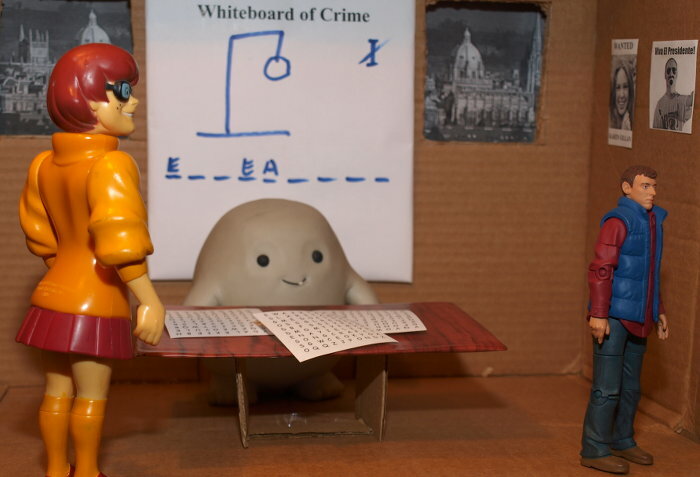 Detective Chief Inspector Grey-um remains a hard drinking police detective who enjoys word search puzzles, being grumpy, bad novelty music and especially solving crimes. It’s almost as if his lack of character development is deliberate, so that people can hear about his cases in any order. Almost. It has been a quiet time for Grey-um between cases. So uninteresting, in fact, that they never talk about it. Grey-um is bored. Terribly bored. But who is this visiting Grey-um in his office? 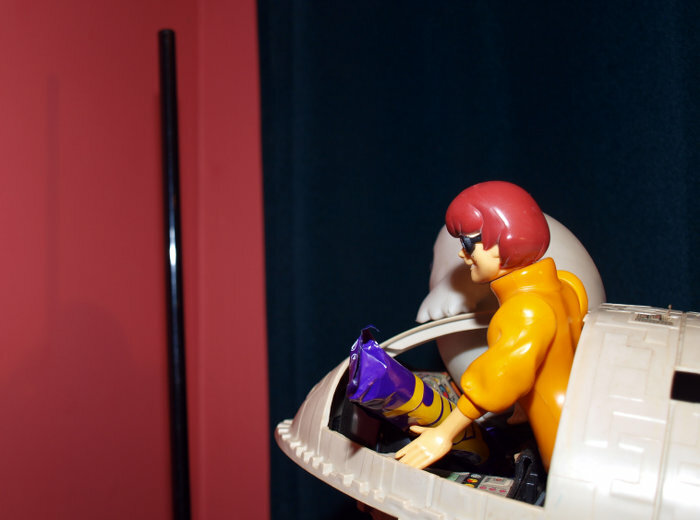 Yes, of course it is Grey-um’s trusty but inexperienced sidekick, Detective Sergeant Velma Dinkley. She has the look of someone desperate for action. “When will we have another case, Sir? I can’t stand doing anymore of this-” bemoans Dinkley before Grey-um cuts her off sharply. “No, Sergeant! You know we must never speak of what we do between major cases!” exclaims Grey-um. Grey-um has another visitor. What a busy morning. It’s Chief Superintendent Naked Tom Baker and he looks grim, no doubt wanting to get straight to the point. “I’ll get straight to the point, Grey-um. Something terrible has happened. Terrible, I say! And grim! 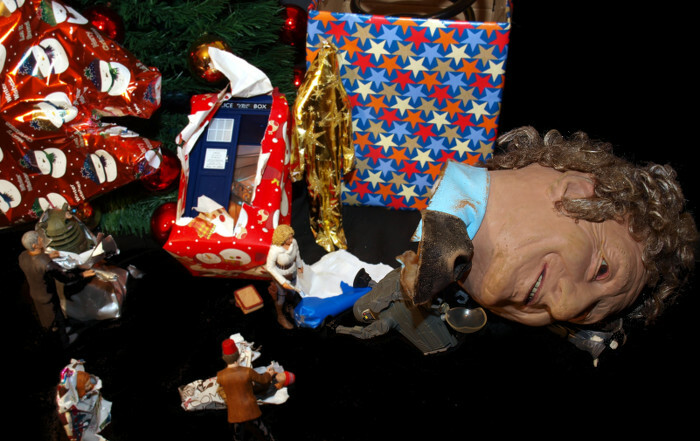 Little Amelia Pond has disappeared!” says Naked Tom Baker, grimly. “It's a tragedy, Dinkley..." emotes Grey-um. “Golly! Well it is Christmas again. 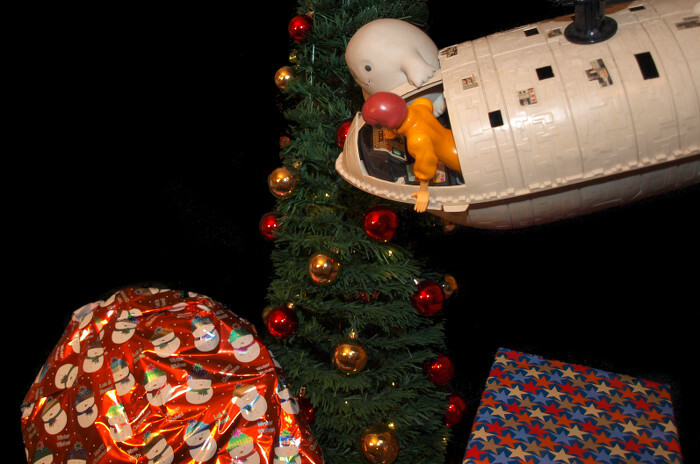 Why do so many of our special cases always seem to happen around Christmas?” ponders Dinkley. “Impossible to say. If we ever did know why specials always happen around Christmas then maybe we could do something about it and make this cesspit of a world a better place.” groused Grey-um. 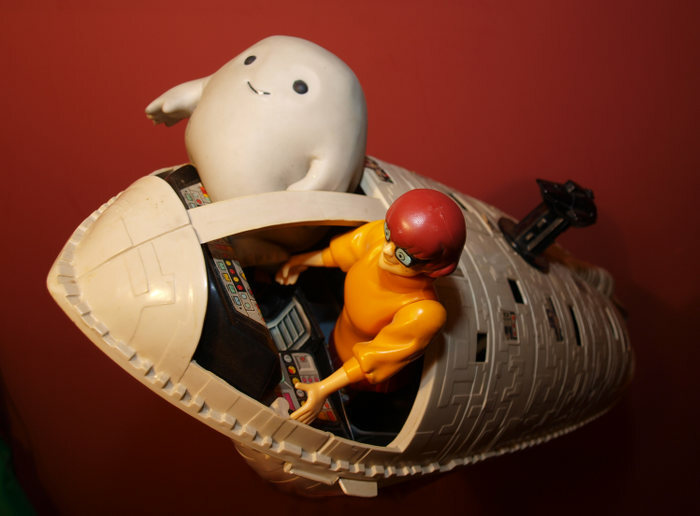 There’s Grey-um and Dinkley, in his quirky and distinctive classic vehicle. They are on their way to the first crime scene of the day, of no doubt many. If Grey-um is flying erratically it’s because he’s had a total skin full en route. Like all good detectives, Grey-um can’t help but let the job get him down. One way Grey-um lightens the mood is to loudly play his favourite music. This time he’s sharing The Birdie Song unto the world. Dinkley does not look happy. Here we are in the TARDIS, little Amelia Pond’s home. 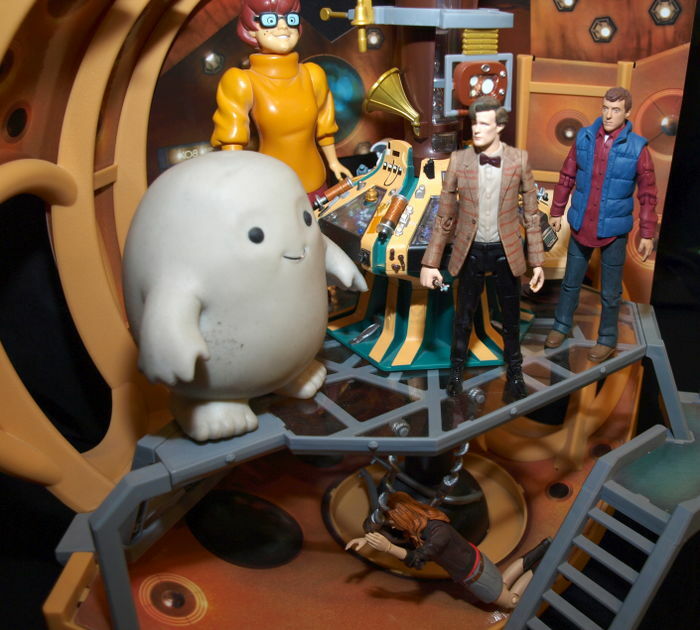 Big Amy, Rory and the Doctor are distraught but nonetheless manage to explain how Amelia didn’t return after going out to buy some fish fingers and custard. “Fraternising with your past self? That’s against the first law of time, isn’t it? I ought to run you all in.” warns Grey-um. “I never got to raise my child, instead the Doctor’s been seeing her while we’re asleep. To compensate, I now get to raise myself. The Doctor said it would be alright and he’s the Lord of Time…” explains Amy. “Of course not! That would make a mockery of every story where people meet their past selves. Terrance Dicks would have had a coronary decades ago!” explains Amy. Rory steps up and hands Grey-um a scrap of paper. 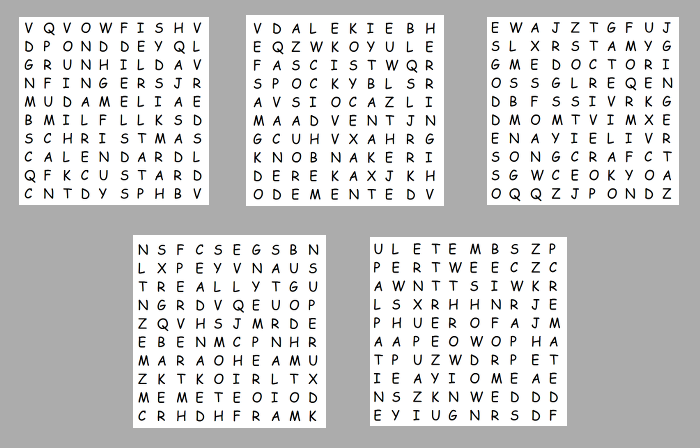 A scrap of paper with a word search puzzle on it. “Excellent, a puzzle! Back to the office with us, Dinkley. This calls for a long sit down and even longer drink, to get the little grey cells going!” declares Grey-um. 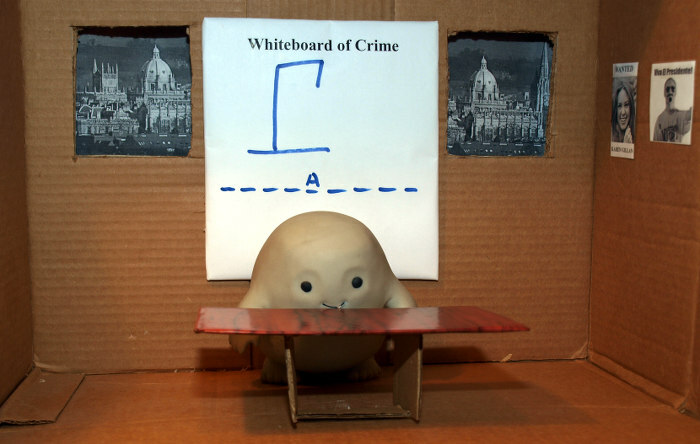 “The game is afoot, sir?” suggests Dinkley. We are back in Grey-um’s office again. But what’s this? That’s Vampire Willow, the local Tom. She too looks upset. “Spit it out, Vampire Willow! The day’s barely started and I’ve already had enough drink to knock out the entire 1970s.” demands Grey-um. “It’s Fascist Spock and Derek the Demented Dalek… They’ve been kidnapped. Murdered maybe! You’ve got to help me, Inspector!” pleads Vampire Willow. “Two this time, sir. Whoever’s taking them is certainly getting bolder.” opines Dinkley. “Yes but at least they haven’t made it personal with us, eh Dinkley. Don’t you hate it when that happens?” adds Grey-um. 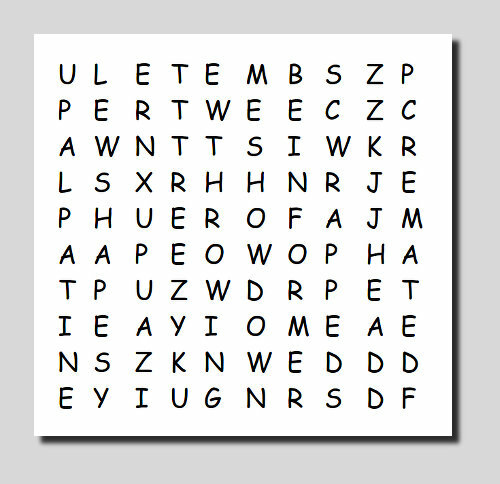 “This puzzle was left, addressed directly to you, Detective Chief Inspector Grey-um.” says Vampire Willow. “Eureka! 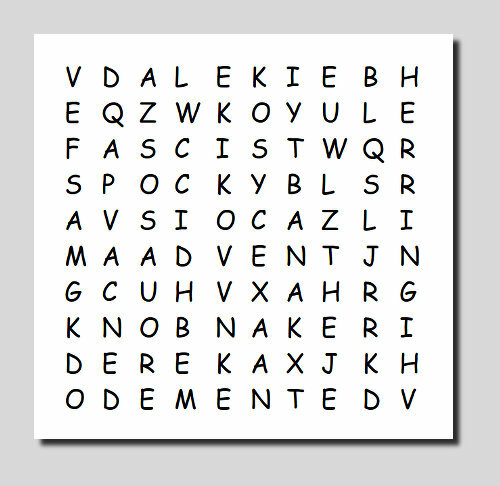 These are particularly challenging word search puzzles, Dinkley. You’d never manage them because you’re an easygoing working class sort, prone to wild hunches. Whereas I am an adipose of refinement and intellect, a deductive detective who relies on reason and logic with my vast intellect and knowledge.” drones on Grey-um. “Yes, sir...” says Dinkley wearily, used to pompous put downs from her boss. 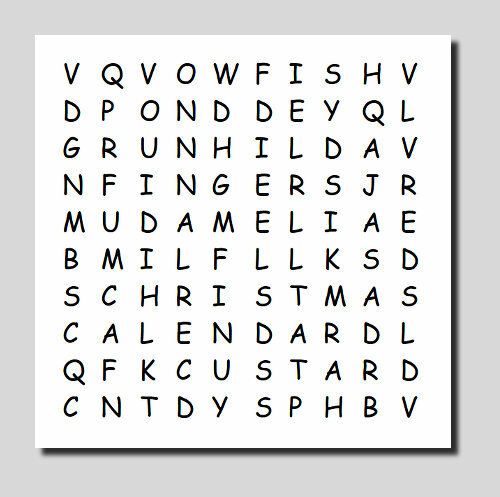 “It has taken even me several hours but I have discovered two words, one in each puzzle… See - this second one has ‘advent’ and the first one ‘calendar’.” announces Grey-um, triumphantly. “Also ‘Christmas’ in that first one - right there, sir?” Dinkley immediately points out. “Enough of that! Nobody likes a smartypants, do they, Sergeant?” says Grey-um, hotly. 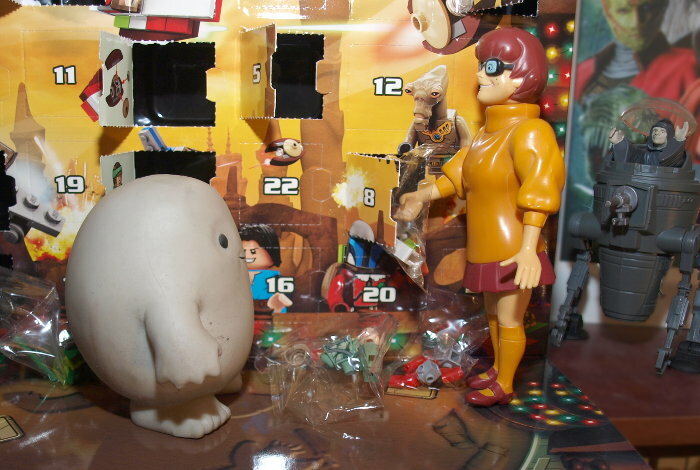 Grey-um and Dinkley have arrived by the Advent Calendar but, typically, there is nowhere to park. 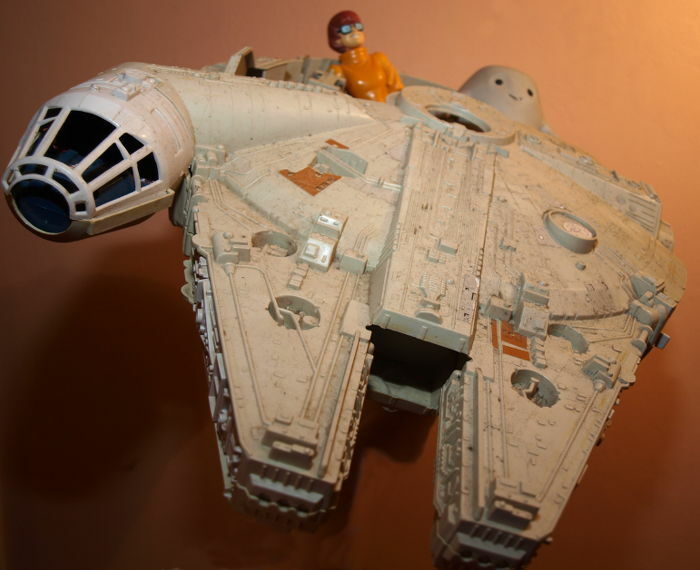 “Dinkley, drop me off here and join me when you’ve found somewhere to park. Find a nice parking space - I don’t want my baby scratched again!” orders Grey-um. “Ah, Dinkley, you’re back at last. It took me a few minutes but I have discovered something…” declares Grey-um. 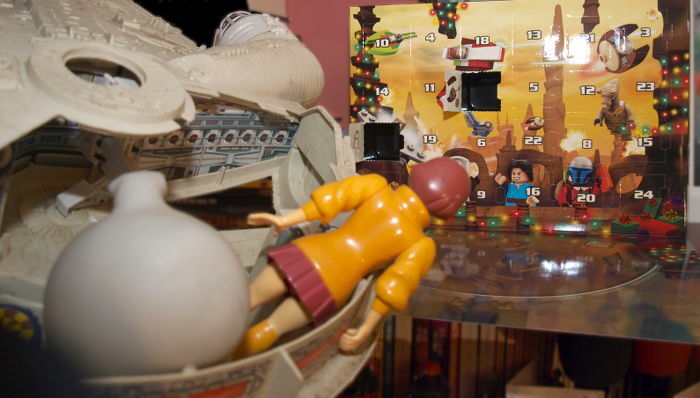 “That it’s Christmas Eve but only the first three doors have been opened on the Advent Calendar? I noticed that before I dropped you off, sir.” says Dinkley. “Er, yes. Shut up, Dinkley! It’s a clue, don’t you see? We should open them up, maybe our missing persons are behind them…” suggests Grey-um. “I’m not sure they’d fit, sir. Is that even wise - it could be a trap!” warns Dinkley. “We’ll keep going, Dink-” Grey-um starts as he opens the ninth door before being cut off by a trap! Right now Grey-um wishes he could fly but he can’t. Fortunately Grey-um is a squidgy little adipose, immune from all but the highest of falls. 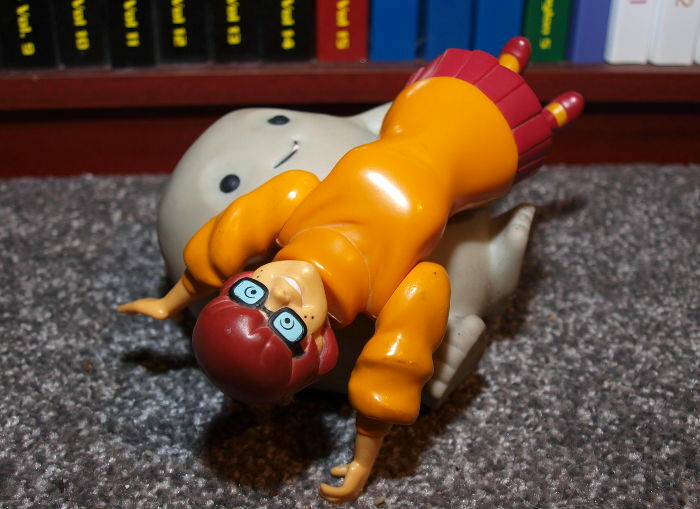 “Get off me, Dinkley! Are you alright?” says a winded Grey-um. “Wha..?” begins Dinkley, slightly incredulously. It was indeed a long walk for Grey-um’s little legs but at last he is back in his office. Look, there’s Rory coming in, looking even more distressed than usual (he always was a pathetic specimen and in no way deserving of Amy). “What? No, it’s not just Amelia but now they’ve all gone! Amy, our grown up daughter River and my son-in-law the Doctor. Also the TARDIS!” says Rory, with more than a slight hint of panic. “Calm down. How can you be sure they haven’t just left you behind - I know I would.” asks Grey-um. “Ah, Dinkley. Where have you been? We are now missing another three people. I can detect a pattern here - first one, then two and now three… What’s the matter?” Grey-um is asking a very puffed out looking Dinkley. “It’s the Chief Super, sir! I think he’s been taken, too!” Dinkley is managing to get out between deep breaths. “Right, that does it. Enough of these games, let’s talk to my snout, The Head of Pertwee.” declares Grey-um. “This just isn’t the same, Dinkley…” groused Grey-um. “That's very unfortunate, sir.” says Dinkley in the most unconvincing way possible. “He’s gone, sir! 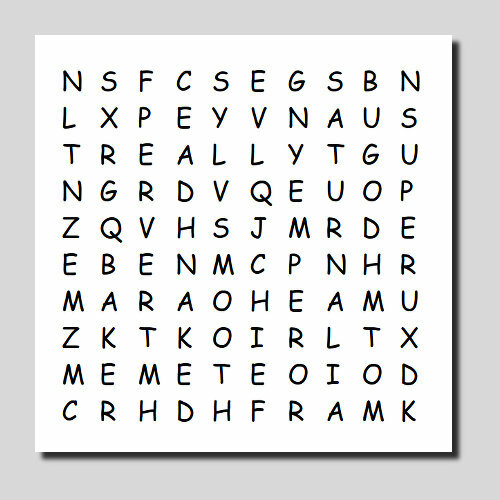 Look there’s another word search puzzle on the ground - he’s been taken along with the rest of them!” cries Dinkley. “This is really getting personal now and I don’t like it, Dinkley. Not one little bit.” complains Grey-um. “Alright, the third then, clever clogs.” challenges Grey-um. 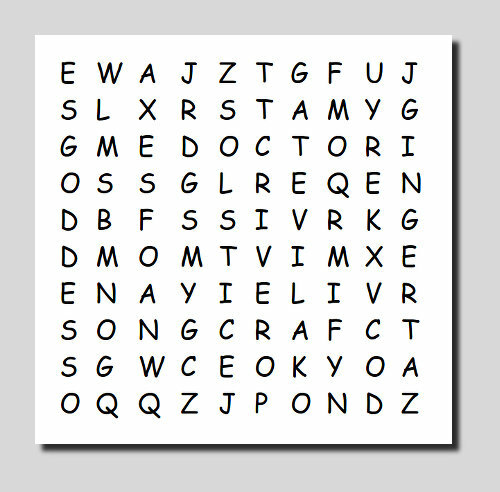 “Er, ‘doctor’, ‘song’ and ‘pond’” says Dinkley, glancing at the puzzle. “The victims again! I’m definitely seeing a pattern here. Continue!” orders Grey-um. “Evil, going down that way…” points out Dinkley. 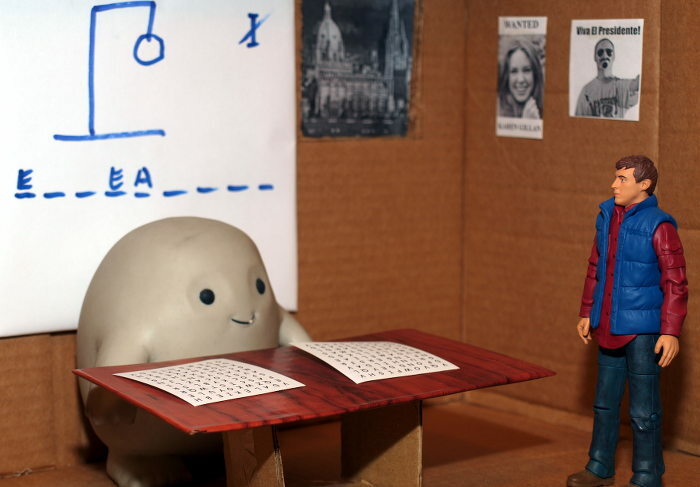 “What about the final puzzle?” asks Grey-um. “No, that creepy old man was banged up for Twiki molestation years ago. Probably random again. See there, going down? Does ‘patine’ mean anything to you?” reaches Grey-um. “No, sir, I think you’re making up words again. So, what about Wilma?” asks Dinkley, worried about someone with a vaguely similar name. “Deering? Sold into slavery to Tigerman, I think. It all came off the rails after that terrible second season. Buck Rogers went postal after reading the early third season scripts. They never got made, of course. They talked about recasting but Lee Majors could only run in slow motion and that just didn’t work for them.” laments Grey-um. “Not Spock.” points out Grey-um. “Look, sir - tree!” exclaims Dinkley, hopefully. “I’ll let you off this time. So? It could be random, it’s a short word.” says Grey-um, doubtfully. “Maybe but the first one has ‘christmas’, the second… there - ‘yule’! The third… there, towards the middle, going down - ‘solstice’. 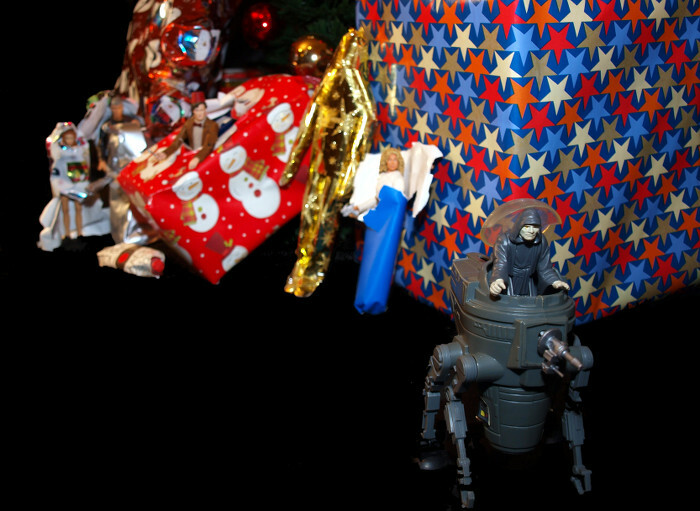 The fourth… the entire length - ‘saturnalia’ - isn’t that something like a Roman Christmas? The last one has ‘tree’. Christmas tree!” declares Dinkley. 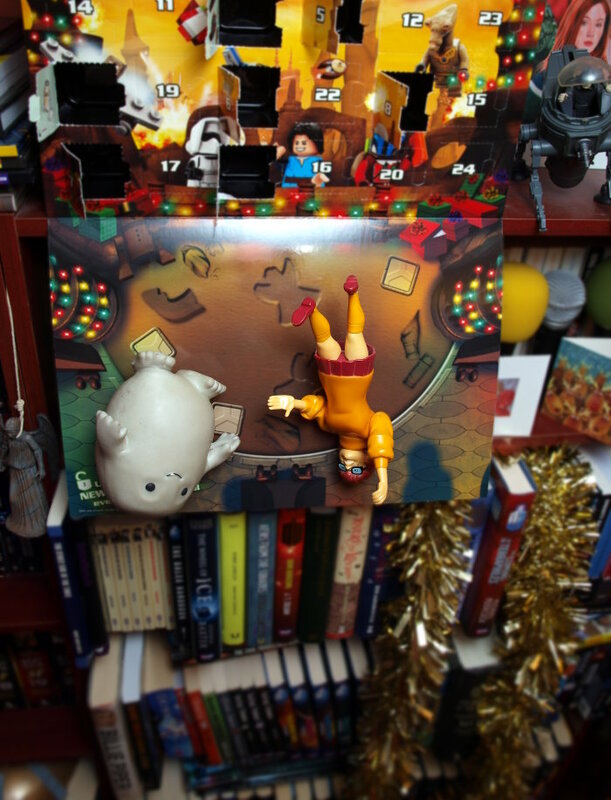 “Dinkley, I think I’ve figured it out - they’re being held at the Christmas tree!” says Grey-um triumphantly, completely unwilling to be aware that it was actually Dinkley that had come up with the idea. “Look, down there sir. 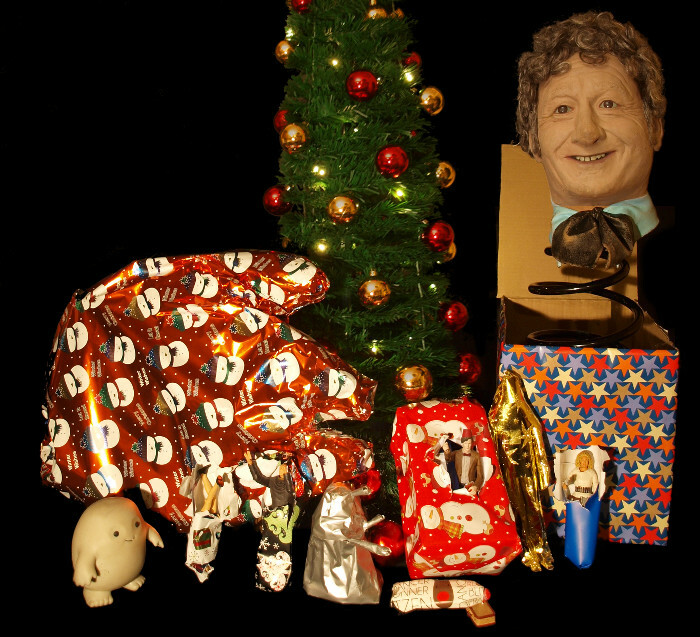 I think those presents are our missing persons!” suggests Dinkley. “They must have heard us - they’re breaking out! Quickly, drop me off.” says Grey-um, urgently. “Everybody lives! Except where’s the culprit? Who did this to all of you?” asks Grey-um of the kidnapped toys. 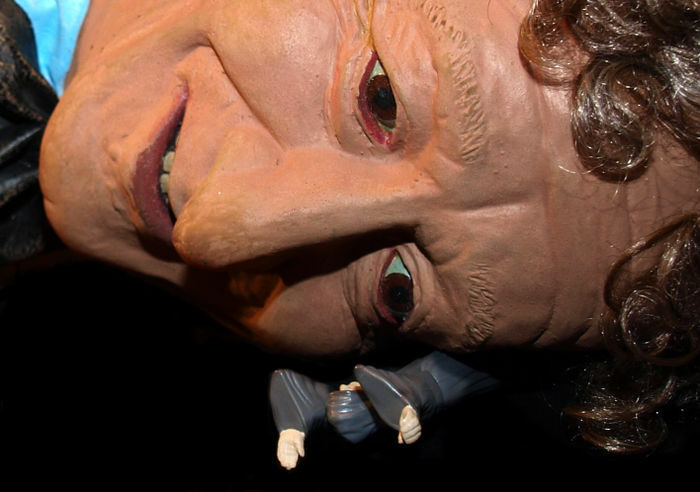 “The Evil Emperor Palpatine!” announces the Head of Pertwee, always on the ball and, for some reason, currently on a spring as if he were a jack-in-the-box. “There he is - he’s getting away” cries the Doctor. With a quick bounce on his spring the Head of Pertwee launches himself towards the fleeing Evil Emperor! “To avenge all the forgotten Kenner Star Wars action figures…” the Evil Emperor Palpatine manages to get out with his dying breath. Dinkley has begun unwrapping the big present. Sure enough it is Grey-um's classic vehicle. 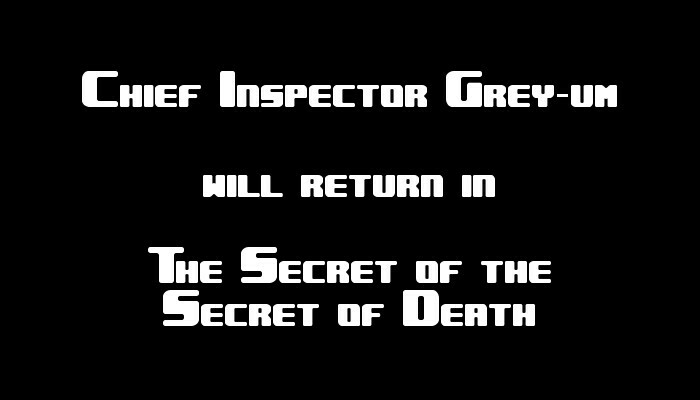 Inspector Grey-um quickly joins her to finish off and is over the moon! “Yes, all those kidnapped toys have been freed. Well, almost…” says Dinkley, eyeing the wrapped figure in the corner. “Still, sir, I’m not sure we should have let them string up his body like that… and the hitting...” says Dinkley, rather disapprovingly. “Well, we learnt one thing - he wasn’t full of sweets!” laughs Grey-um. 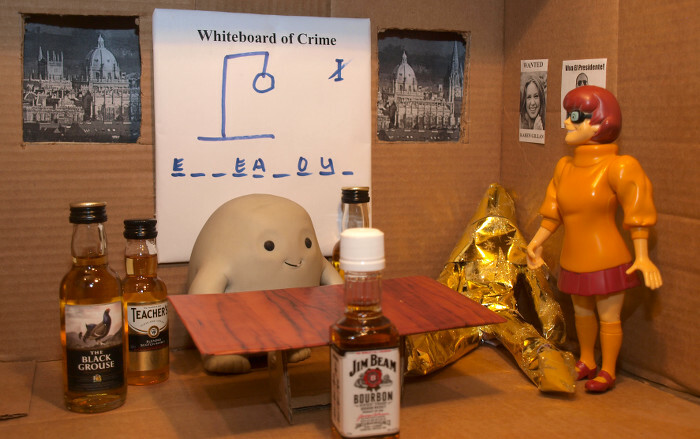 In typical fashion, Grey-um and Dinkley finish the case with a laugh into freeze frame.